Frontispiece from Homer nach Antiken gezeichnet. Viertes Heft. While employed as director of the art academy in the Kingdom of Naples during the 1790s, Wilhelm Tischbein conceived the idea of creating an illustrated edition of Homer’s Odyssey using classical sculptures of Greek heroes and scenes on antique cameos and vases as his models. That the ancient method of grape growing depicted in this etching was still practiced in parts of southern Italy prompted Tischbein to use it as the introductory plate to a section devoted to Odysseus’s encounter with the one-eyed giant Polyphemus. Wilhelm Tischbein is best known today for his memorable portrait of the great German writer Johann von Goethe wearing a broad-brimmed hat, reclining among the ruins of Roman Campagna--a head and hat given wider currency in the 1980s in a series of paintings by Andy Warhol. Tischbein acted as Goethe's guide in Rome in 1786, and the next spring they traveled together to southern Italy. Like Goethe, Tischbein was enthralled by the lush terrain around Naples, seemingly unchanged since Homer's time. 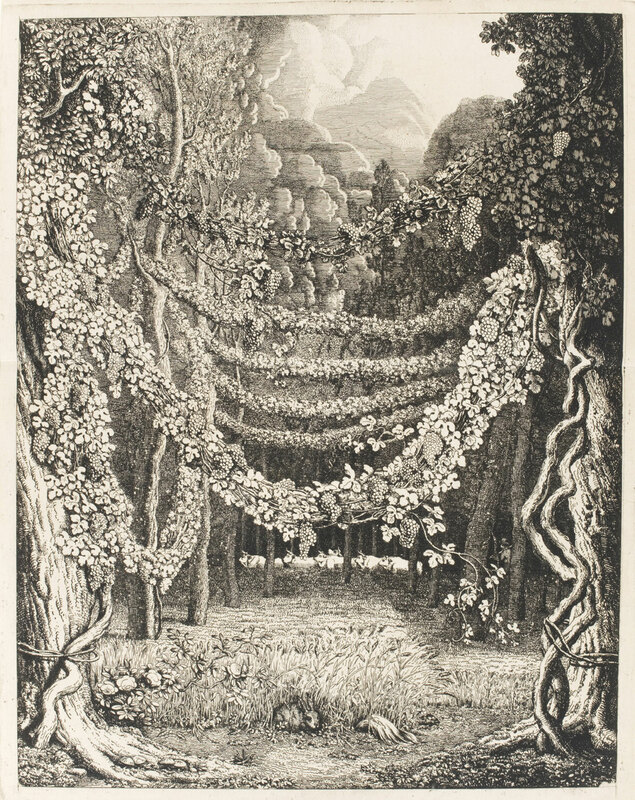 This etching of tended trees and festooned vines served to introduce the section of the Odyssey devoted to Ulysses' encounter with the one-eyed giant Polyphemus in an illustrated edition of Homer begun in Naples by Tischbein around 1796. For the other pictures, rather than inventing settings, as he did here, for a text he knew by heart in German, the artist brought the epic to life by recording the features of Homer's heroes from ancient sculpture in local Italian collections and by copying scenes of Ulysses' adventures from antique pots recently excavated in the nearby countryside. The Museum's collection of German prints from around the turn of the nineteenth century, of which this is an example, is almong the richest in any museum in the United States. John Ittmann, from Philadelphia Museum of Art: Handbook of the Collections (1995), p. 224.